Summary: Deep in the heart of Oxford's Bodleian Library, Diana Bishop - a young scholar and the descendant of witches - unearths an enchanted alchemical manuscript. Wanting nothing to do with sorcery, she banishes the book to the stacks. But her discovery has set a fantastical underworld stirring, and soon a horde of daemons, witches, and other creatures descends upon the library. Among them is the enigmatic Matthew Clairmont, a vampire with a keen interest in the book. 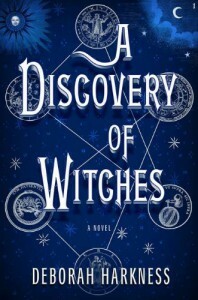 Equal parts history and magic, romance and suspense, A Discovery of Witches is a mesmerizing and addictive tale of passion and obsession that reveals the closely guarded secrets of an enchanted world. - Penguin, 2011. This was, quite simply, an epic to read. I'm not inexperienced with long novels, I too read Harry Potter as a child, but I honestly felt as if I was returning to my surroundings weeks after I had initially began reading instead of mere hours or minutes, depending on how long I had been reading. That being said, the journey was worth every minute. To give a bit of brief history about my experience in encountering this novel, I was hesitant to buy it and read for two main reasons: 1) I couldn't buy every book that had "witches" in the title simply for that reason alone. It's an affliction I still suffer to this day. 2) I was afraid this was just another product of the Twilight mania that had gripped the world. (Spoiler alert: I don't like the Twilight Saga. That's putting it extremely lightly). I now realize that this was incredibly insulting and naive to think especially since Harkness was most likely in the process of writing this when the Twilight books were being published and the movies were being made. I will not make that mistake again. Even though I was initially very interested in the book, I told myself to wait. If I found it again later and was still interested, I would buy it. Lo and behold, I found it again at a college bookstore (I was moving in my sibling for freshman year) and I told myself to just give in and buy the damn thing. I am so glad I did because I really enjoyed this book. Spoilers will be kept to a minimum as always. What can I say that hasn't been said already? The writing is spectacular, the characters are fascinating, and the plot is mysterious and compelling enough to make the reader want to keep going. Harkness obviously has done her research on the topics she focuses on in this book. She builds a world that, while still based in real-world timelines, feels so plausible that it's a wonder no one has ever thought of it before. While the history and scientific subjects can make for dense reading, it's worth it. The subjects are presented in an interesting way so that it doesn't sound like a college lecture. The topics are connected to the characters and therefore, by making the reader care about the characters, the reader cares about the more complicated subject matter. Diana herself isn't as perfect as I'm sure some readers would claim. She is borderline Mary Sue in some ways, but Harkness gives believable reasons for those qualities. Diana doesn't naturally possess all of the qualities that some would say make her too perfect - and if she does, there is a reason. I appreciate that as I know I have experienced many stories where the protagonist is perfect for no adequately explained reason. Matthew is a wonderful character, whom I appreciate very much. I know the upcoming tv series on this trilogy has already cast him so there is an official "look" for the vampire, but I still had fun imagining what he looked like. He's flawed in ways that are very human and I'm glad Harkness isn't part of the "Beautiful Monster Needs Love to Save Him" school that I've seen in recent supernatural fiction. Even though some might say that Diana and Matthew's relationship is positively medieval (it's funny if you've read the book), I don't think it's unbalanced. You're not supposed to remain the same person you were at the beginning of a relationship so Diana and Matthew's love affects them in different ways. They are changing each other bit by bit so that their relationship can be strong and last for as long as possible. I do feel as if the plot takes a very long tangent as it begins with focusing on the alchemical manuscript Diana finds, then veers off to focus on Diana's growth as a character through her experiences with Matthew. The manuscript and Diana are definitely tied together, but I believe Harkness wanted to focus more on world building than on traveling deeper into the plot - that's what the sequels are for, I'm assuming. Overall, I really enjoyed the story and the characters. It's going to be a long while until I pick up the next part of the series, but I'm looking forward to finding out what happens next. I especially am looking forward to the television series. I give A Discovery of Witches an A.